The economic benefits of energy efficiency extend far beyond lowering energy bills for consumers. Efficiency also contributes to economic development and job creation. But who benefits most from these economic opportunities? At every step of the economic value chain produced by efficiency investments (see figure below), there are opportunities to target the economic and social benefits to those households, businesses, geographies, or sectors for whom they will make the biggest difference. The results of these choices can include lower costs for low- and moderate-income families and small businesses; opportunities for disadvantaged, local workers to get jobs with good wages; and new and retained economic activity in disinvested communities. Designing efficiency programs to achieve these goals, in addition to saving energy, can have benefits that ripple throughout the economy, helping to address inequality, build a stronger middle class, and improve economic competitiveness. All households and businesses can benefit from reduced utility bills from energy efficiency but for low-income households and small businesses, the cost savings can have a very significant impact on their overall budget. For example, while the average U.S. household spends 4% of income on home energy costs, low-income families spend 17% of their annual income on energy expenditures. For these families and businesses, cost savings from energy efficiency can mean the difference between going into debt (or choosing what to forgo for the month) and being able to pay for investments like education or new employees. Programs that provide efficiency services to these cash- and credit-constrained customers can have positive economic development impacts on local communities because these customers have other unmet needs and therefore are more likely than the average customer to immediately spend the money they save. For example, every dollar invested in efficiency in low-income households through the Weatherization Assistance Program results in $2.53 in energy and non-energy benefits for a community. Programs that effectively provide efficiency services to renters, moderate-income households, and small businesses can have similar strong (although somewhat smaller) economic development impacts. 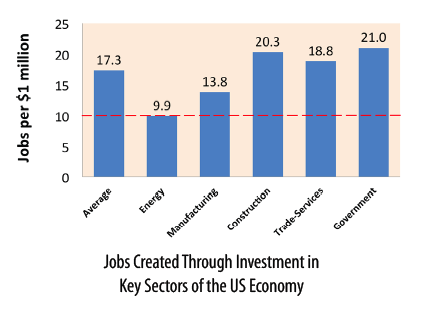 An energy efficiency investment creates more jobs than an equivalent investment in either the economy on average or in utility sector and fossil-fuels. As an example, a $1 million investment in a building efficiency improvement will initially support approximately 20 jobs throughout the economy. By comparison, the same $1 million investment in the economy as a whole supports 17 jobs. As of 2010, at least 830,000 jobs related to energy and resource efficiency already existed around the U.S. and their numbers were increasing at an annual rate of 3%. In addition to the immediate job creation benefits from energy efficiency program investments, another—and greater—job creation benefit of efficiency results from the consumer savings on energy bills. When a business or household lowers their energy costs, they are then able to spend that money elsewhere in the economy, resulting in additional jobs. On average, this shift in spending supports 17 jobs per $1 million compared to the 10 jobs per $1 million supported through energy generation and distribution. Most energy efficiency jobs are also local because they often consist of installation or maintenance of equipment locally. This is less true of conventional energy supplies and delivery. Not only do energy utilities often invest more in fuel and equipment than in employment, but many of the jobs that do exist are related to obtaining and transporting fuel out of state or, for multi-state utilities, are administrative jobs outside the area. An even more important local employment impact from energy efficiency is the impact of energy bill savings on the local economy. Energy expenditures are, more often than not, sent outside the local economy; out of state or outside the U.S. entirely. If that money is instead spent on other products or services, it has a larger impact on local businesses and jobs. For the U.S. as a whole, one dollar of avoided utility bill costs has 2.24 times the effect on domestic employment and wages compared to one dollar spent on utility bills. Similar ratios for local employment benefits exist at the state and local levels. Avoided utility costs also benefit local businesses. For the U.S. as a whole, avoided utility costs result in 1.16 times the local value-added benefits compared to spending on utility bills. Jobs in efficiency services are well paying and in a growing industry, and many of them are available to employees without higher education. A higher percent of clean energy jobs, including those in efficiency, are accessible to low-credentialed employees compared to the fossil fuel and utility sectors (48% compared to 42%). Perhaps even more importantly, clean energy investments also result in a larger percent of jobs with above-average earnings potential for low-credentialed employees (29% compared to 13% for the fossil fuel sector). Forty-nine percent of existing energy and resource efficiency jobs are held by employees with a high school diploma or less. The average wage is $4,900 above the national median and 75% of employees have middle-wage jobs (where wages fall within twenty percent of the national median). Improving access to programs for disadvantaged customers Participation rates in energy efficiency programs are often low among rental properties, low- and moderate-income households, and small businesses. Improved outreach techniques and expanded and tailored programs can help to engage these hard-to-reach customers. Such program approaches include “one-stop shop” program designs and partnerships with community organizations and local governments. These program opportunities that focus on community benefits can complement policies that treat efficiency primarily as a utility resource. Including non-energy goals in energy efficiency programs Most energy efficiency programs are not evaluated based on their non-energy impacts, such as economic development benefits. Program administrators are primarily interested in achieving the energy goals assigned to them. If non-energy benefits—like the creation of jobs and the development of local businesses—are to be effectively achieved, then they must be included as formal program goals. More programs and their goals should be designed to maximize these non-energy benefits in addition to energy benefits. For example, the District of Columbia Sustainable Energy Utility is evaluated on metrics for job creation, local economic investment, and benefits to low-income households, as well as energy-related benefits. Implementing “High Road” policies and agreements These policies, also called Community Workforce Agreements, ensure that the benefits of energy efficiency investments accrue to disadvantaged communities and workers. They often include provisions for local hiring, living wages and benefits, and career development and training opportunities for employees. Clean Energy Works Oregon is a pioneer in using these agreements to achieve community benefits, a trained workforce,and high-quality efficiency projects. Organizations like the Emerald Cities Collaborative and Green for All are working with stakeholders in communities around the country to expand the use of High Road agreements.